Concept: Providing alternative energy sources to low-income households and developing black-owned green enterprises. How the business idea came about: I was working on the NPO ‘Igniting Humanity”, a social initiative that assists in reducing carbon emission which inspired the business idea. During mid-2016, after her return to South Africa following the completion of the Mandela Washington Fellowship Leadership Programme in Washington USA, Zintle Raziya, a vibrant, young entrepreneur involved in the renewable energy sector and co-founder of Yabasha Energy Solutions; was approached by technology supplier Tasol Solar Energy Solutions, to establish a turnkey energy company. The proposition involved catering to the low income housing sector to provide an alternative energy source through the installation of solar heating water geysers. It was thus that in October 2016, Yabasha Energy Solutions, a company that also focusses on developing black-owned Youth Green Enterprises, was formed. It was also while Zintle was working on the NPO ‘Igniting Humanity”, a social initiative that assists in reducing carbon emission that she was introduced to Seed Academy and in March 2017 she embarked upon the AccelerateHer Programme. 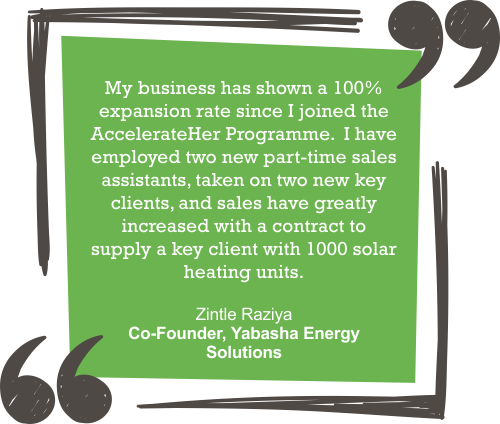 ‘When I first joined the AccelerateHer Programme, my business was still in the ideation phase and I had no clear direction as to how to get it up and running. But, once I had settled in, the people at Seed Academy made me feel so comfortable with the process that I felt a tremendous sense of knowing that I would be guided every step of the way,’ says Zintle. ‘Seed Academy’s AccelerateHer Programme is a first-class training platform “filled with energy” that has helped me tremendously’, says Zintle. ‘The programme has enabled me to develop my business skills and to take my business to an entirely new level altogether. I was introduced to how business modelling works as well as what marketing my business actually entails. Through the branding and marketing workshops I learnt how to pinpoint and refine my customer value proposition and identify key clients. The training I received has also been instrumental in providing real financial guidance in the sense of ‘how to get the financials right’, maintains Zintle. Zintle asserts, ‘I thoroughly enjoyed the Master Classes and sessions with real industry professionals. Donna Rachelson has been a great inspiration. I also had the opportunity to share the experience with a dedicated group of young, ambitious black women who want to make a real difference in the world’. ‘I recommend Seed Academy to any aspiring entrepreneur. The developmental side of the programme has been phenomenal. Seed takes you from confusion to structure and provides the framework that enables the potential to grow. I can honestly say that I felt like I was taken from zero to hero in a very short time with the help of such amazing people,’ Zintle confirms. Seed Academy/WDB AccelerateHer powered by Shell Downstream South Africa (Feb – May 2017). AccelerateHer is a 90-day accelerator programme for female entrepreneurs designed to fast-track their development and create pipeline for the WDB Seed Fund. Clients: Acquired two new key clients in the form of property developers. Interested in learning more about Seed Academy? Ready to be part of the solution?